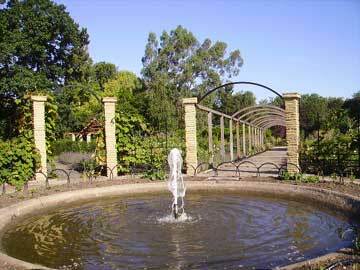 October 2005 saw the Trust's Summer Walk season end with a visit to the newly restored Peckham Rye Park in southeast London. Park Manager Paula Johnston of the LB Southwark guided the Walk. Those attending were able to admire the extensive and painstaking restoration of the park which has taken place over the last year. Peckham Rye Common has been a popular open space for centuries. Over the centuries local residents battled to prevent development of the common. Finally in 1868 Camberwell Vestry purchased the rights of the Lord of the Manor of Peckham Rye to preserve the common as a public open space. Pressure on the space led the authorities to extend the public open space by the purchase, for £51,000 in 1892, of the 51-acre Homestall farm next to the common. This was laid out as Peckham Rye Park by Lt-Colonel J.J. Sexby, the London County Council's first Superintendent of Parks. Over 100,000 people attended its opening in May 1894. Sexby's layout catered for everyone. There were two acres for tennis courts, twelve acres for cricket, and ten and a half acres for a children's playground around the park. Inside the park itself there was a bowling green, a lake, ornamental flower beds, a rockery with a small grotto, an American garden, a Japanese garden and shelter and an old English garden. There was even a whalebone arch walk popular with courting couples. Sadly by the 1940s the whalebone arches had become so brittle they had to be demolished. Maintenance of the park slowed down after WW1 and in WW2 large areas of Peckham were badly bombed and had to be rebuilt. The local North Peckham housing estate became a byword for social problems. Maintenance of the park took a low profile and by the end of the 20th century Peckham Rye Park was buried beneath decades of vegetation. But such was the excellence of Sexby's design that the park was not dead, only sleeping and was listed as Grade II and greatly loved by local residents. In the early 21st century Friends of the Park joined forces with the LB of Southwark to seek a Heritage Lottery Fund (HLF) grant for its restoration. In January 2003 the HLF announced a final award of £2.37 million, with Southwark contributing a further £557,000. From January 2004 consulting landscape architects Chris Blandford Associates worked with the Friends and Southwark to produce detailed designs and specifications for the restoration. In summer 2004 ISS-Waterers, one of the UK's leading landscapers, won the tender for the contract and work started in September 2004. The park has a small lake (often referred to by local residents as the Pond), which is fed by a tributary of the river Peck, which runs through the park. This also feeds the water features in the Japanese garden and the Edwardian rockery. Over the last century the pipework had cracked, the pond's silt trap had become blocked and the pond edges had been eroded and damaged by weeds and trees. The resulting lack of oxygen in the water killed the fish in the lake. Fresh water aquatic specialists AGA Group supervised the restoration of the water system.. Now the water circulation system has been completely replaced, with new underground pipework throughout the park, leaf filters, two new underground water storage tanks and a new circulatory system with a weir and pumping system. One of the most popular areas is the Sexby garden, in the centre of the park, named after the park's original designer, Lt-Col. J J Sexby. This has now been restored to its original design, set out in four quarters with a hexagonal arbour containing a rustic seat in each corner and a fountain in the central axis. Identifying which shrubs and trees to plant in the restored American garden caused a few problems. For authenticity, the species needed to be those which Sexby considered appropriate to a "typical" American garden: these are not necessarily modern American plants and shrubs. Thinning and even clearing the rhododendrons here, heavily overgrown, was long overdue. Just before restoration started, vandals torched the yew bushes nearby - a poignant reminder of just how vulnerable many parks are today. There was a minor delay at the start while the lake water was tested for toxicity - old garden sites often have lead and arsenic in the soil. Fortunately the soil tests were clear and ISS-Waterers proceeded with draining the lake and removing the silt from the lake bed. In all around 2000 cubic metres of accumulated silt was recovered and spread out in the old store yard, mixed with chalk and woodchip, to aerate it so that it could be recycled. Considerable amounts of vegetation were cleared around the lake, including self-sown alders and other weed trees. The edging of lake was rebuilt with stone where the timber pilings had worn away - a process which caused one mature wiIlow balanced on its edge to fall in. New planting was set out inside new railings around the perimeter and the lake is currently settling in before the wildlife can be reintroduced. The grotto and rockery area and stream near the main entrance were also cleared and replanted and the main entrance gates were refurbished. A number of large semi-mature trees, Zelconias, were imported from Holland and planted early in the spring, followed by a new lime avenue and an elm avenue. Horticulturalists are particularly interested in an avenue of 34 new semi-mature New Holland elms, which have been planted in two rows, one on each side of the path which runs alongside the American and Sexby gardens. These were imported from Holland where they have been specially bred from stock resistant to Dutch Elm disease. This is believed to be the first large scale planting of this species in the UK. Peckham Rye's Japanese garden dates from 1908, when they were newly fashionable. It includes a Japanese shelter and bridge together with many distinctive Japanese plants. The Japanese shelter and bridge were renewed, the choked stream cleared, and original trees and shrubs revealed. Throughout the park, paths were re-laid, new planting installed and new seats provided. The bowlers haven't been forgotten either: a smart new pavilion replaces the old converted container, which previously served as their clubhouse, even if the grass on the bowling green has still to recover from the building work. On 18th September 2004 the Friends of Peckham Rye Park had held a fair to mark the closure of the park for the works to start and on 10th September 2005 they celebrated its reopening with a fair on Peckharn Rye Common, outside the park gates. The new planting is well established, although it provided some tense moments for Waterers' Project Manager Pete Steyn during the prolonged dry spell this summer. A head gardener Richard Glen and an apprentice have now been employed. Maintenance is an important aspect of any park restoration and the Friends sought reassurance about this. The HLF grant conditions include a requirement for a ten-year management plan to be established by the local authority when restoration is complete. Sadly but perhaps inevitably, one discordant note mars the park's newly minted beauty. Since the restoration started, the works have been subject to pilfering and vandalism. After the park reopened to the public, vandals returned regularly at night to attack the new works with spiteful vengeance. The Japanese and Sexby gardens have been a particular focus of their malice. Social deprivation remains a significant problem in parts of Peckham, despite the large sums of public money being poured into the area and anti-social behaviour continues. For the present, at least, the park is being patrolled at night by security guards with large dogs. Southwark's roving wardens will monitor the park for anti-social behaviour and ASBOs and fines will be vigorously sought. A number of initiatives are planned to cut down the more mindless vandalism. These include the refurbishment of the adventure playground on the edge of the park (a separate project), and the appointment of a Young Friends of the Park co-ordinator to visit schools and get the local young people to view it as their park. This will include promoting schemes such as helping with the planting. On a recent visit, the park positively sparkled in the late summer sunshine. Families picnicked on the lawns, teenagers cycled and joggers jogged around the newly gravelled paths, pensioners relaxed on the new rustic benches and toddlers poked sticks into the pool in the Japanese garden. Many visitors just strolled around admiring the planting or sat on the grass relaxing in the sun. Finally a group of local sculptors, inspired by the visions of "angels in the trees" seen in the park by the 18th century metaphysical poet William Blake, are seeking funds to create a local sculpture which will represent Blake's vision. Thanks are acknowledged in the preparation of this article to Paula Johnston (Park Manager) and Eleonora Oliva (Project Officer) of LB Southwark, Toby Goodman of Chris Blandford Associates, Peter Steyn of ISS Waterers and members of the Friends of Peckham Rye Park.